The Dakar Rally no longer runs between Paris and the Senegalese capital from which it takes its name, sensibly choosing to avoid the threat of targeted terrorist attacks. But steering well clear of roadside bombs doesn’t mean the race has gone all soft. The event remains one of the very toughest challenges in motorsport – its five-thousand-mile, two-week test of mettle has simply been transplanted to South America for safekeeping. Four categories of vehicles contest the race – cars, trucks, bikes and quads. When the winning vehicles in the Dakar Rally 2012 trailed sand across the finish line in Lima on Sunday, Cyril Despres had won the bike category on his Red Bull sponsored KTM, Stéphane Peterhansel’s heavily modified Mini Countryman All4 had come out top among the cars, Gerard De Rooy had brought home his 840-horsepower Iveco to win the truck category, and finally Alejandro Patronelli had triumphed in the saddle of his Yamaha quad-bike. And way down in 77th place overall was a class winner worthy of a much closer look. A Latvian entry driven by Maris Saukans won its alternative powertrain class, by virtue of being the only competitor in the rally driven by an electric motor. Built and entered by Latvian motorsport engineering company OSC, the Oscar eO is a petrol-electric range-extended EV. Crammed inside eO’s jacked-up body are lots of lithium-iron-phosphate batteries – enough to store 52kWh of energy or a bit more than twice the capacity of a Nissan Leaf. They feed power through to a pair of electric motors with a combined output of 180kW (240bhp). This is sufficient to maintain a top speed of about 90mph, but in short bursts the motors can furnish up to 315kW (420bhp) alongside 800Nm of torque – useful for climbing the unforgiving dunes of Chile’s Atacama desert. The battery pack alone stores enough energy for 150km (93 miles) of challenging terrain, or up to twice as far on easier surfaces. 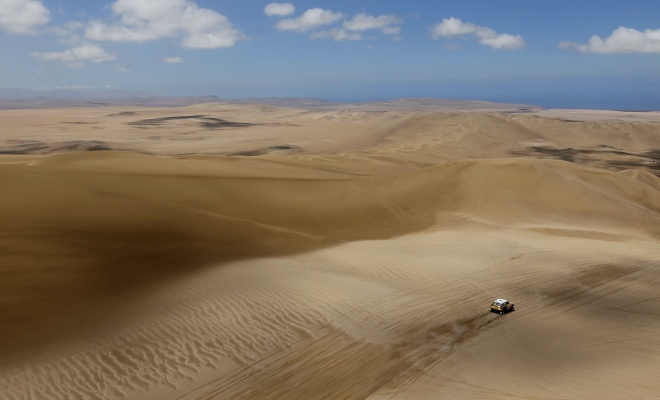 Unfortunately, the notoriously gruelling Dakar stages demand a range of around 800km or 500 miles. With current technology it’s simply not feasible to fit enough batteries into the car to cope – as it is, the driver and co-driver have to virtually sit on them. So when the batteries run flat, a Nissan petrol engine takes over, generating power to feed the electric motors in much the same manner as a Vauxhall Ampera or Chevrolet Volt. As well as regenerative braking, the Oscar eO boasts regenerative damping, absorbing energy as the car thumps and bumps over rough surfaces and channelling it back into the battery to eke out a few more miles. With such a low top speed, car number 370 was never going to win – simply reaching the finishing line with everything still working was always the goal. Coming home 77th out of a starting field of 174 cars was therefore a victory over the odds that shouldn’t be underestimated. No doubt the Oscar eO will be back next year, faster and better. And hopefully there will be some other electric cars to race against too. To find out about all the action on and off the road, visit Red Bull's official Dakar site where you'll find updates, videos, blogs and more on this gruelling endurance challenge.